What horse owner, trainer, rider, or breeder isn’t looking for a happy, healthy horse? Horses that perform better, behave better, sell better, and even incur fewer vet costs? Unfortunately, the reality is that horses rarely are perfectly happy and healthy. And for many horses, the root of their problems begins in the digestive tract. 97% of performance horses have gastric and/or colonic ulcers as found in our own peer-reviewed published study. Those are some awfully staggering numbers – and a lot of uncomfortable, irritable, sick horses. There’s a lot of conventional wisdom out there about diagnosing and treating ulcers – yet ulcers continue to be a prevalent problem for horses. In order to keep your horse at its healthy best, it’s important to understand the signals your horse is giving you as well as all of the options for treating and preventing ulcers. The “Your Horse Ulcer Free” series will equip you with the knowledge to recognize, treat, and ultimately prevent ulcers in a better, more lasting way. In Part 1: Overview of Equine Ulcers, we’ll fill you in on the basics of equine ulcers, including what they are, how to recognize the signals, and a better method for treatment and prevention. Put simply, an ulcer is a lesion in the lining of the digestive tract. There are two types of ulcers: gastric and colonic. Gastric ulcers occur in the stomach while colonic ulcers occur in the hindgut, specifically the colon. While both are lesions in the mucosal lining of the digestive tract, they have different causes, symptoms, and thus treatments. Ulcers can range in severity from mild lesions that heal on their own and don’t leave behind any scarring, to more serious lesions that can cause permanent damage and sometimes even death. Diagnosing ulcers in horses can be tricky. 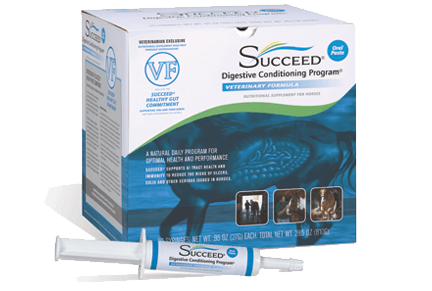 The subtle signs that your horse is experiencing a digestive issue like ulcers can also be indicative of other medical conditions. And many signs of digestive discomfort are often attributed to behavioral or training problems. If you notice any of these symptoms in your horse, it’s important to have your vet check for ulcers so that you can either begin treatment or rule it out as a cause before moving on to other possibilities. Dietary and management changes are the best way to help a horse recover from and avoid future occurrences of ulcers. While there are FDA approved drugs available and usually prescribed, they are only effective on gastric ulcers. And because their function is to stop acid production in the stomach, may actually allow more undigested starch to reach the hindgut creating or exacerbating issues there. Addressing these root causes is the best way to keep your horse-ulcer free for the long-haul. Gastric ulcers, or ulceration of the stomach lining, are the most commonly recognized form of digestive issues in horses. We’ll talk about all the possible causes and signs of gastric ulcers as well as the problems with the typical diagnosis and treatment techniques. 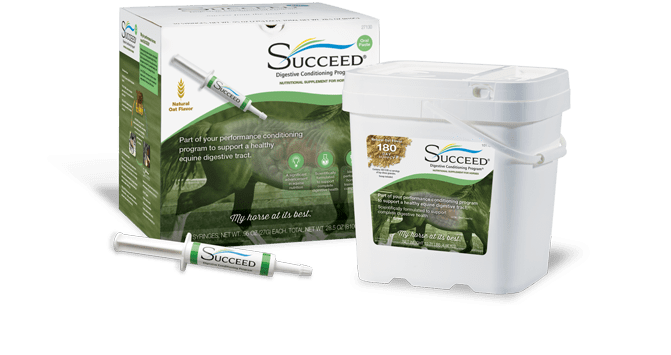 Be sure to subscribe to the SUCCEED blog or sign up for email notifications in the sidebar so you don’t miss Part 2: Equine Gastric Ulcers.